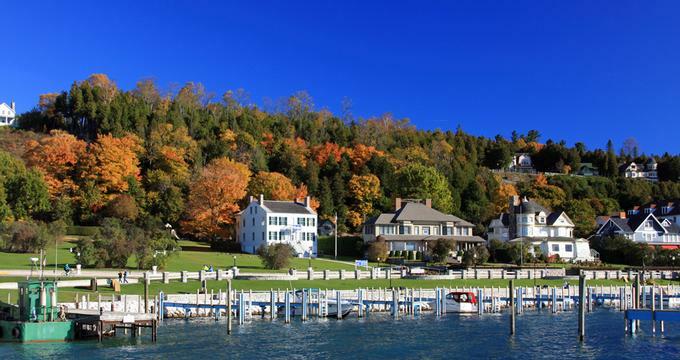 Mackinac Island is a jewel of an island on Lake Huron in Michigan. Surrounded by rugged scenic rocks, calm lake waters and fragrant evergreen forests, the island is a beautiful vacation destination. The fact that cars were banned on the island as back far as 1898, and more than 80 percent of the island was made a part of a national park, says a lot about the dedication to purity that the people of the island have. 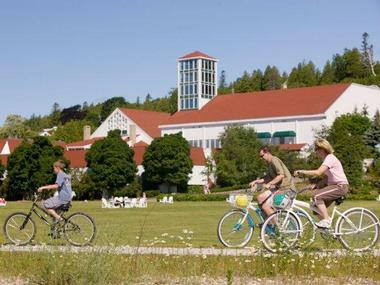 Mackinac Island is a great place to explore on foot, by bike, kayak or in a romantic horse-driven carriage. The story of the Mackinac Island State Park is the story of Mackinac Island – more than 80 percent of the island is part of the park. Since the park was established in 1895, most of the land has been kept in its natural condition, to be explored and enjoyed as nature intended. The park is covered by a mixed coniferous and hardwood forest which is home to wonderfully fragrant spruce, cedar, paper birch and balsam fir growing on the moist soil, while hardwoods like sugar maple, red oak, hemlock, beech and white pine thrive in better-draining soil. There are no large animals on the island, but there is a profusion of birds such as ducks, gulls, finches, warblers and sparrows. Squirrels, bats, hares and chipmunks are common and hikers can occasionally spot a red fox, muskrat or a raccoon. Camping and hunting are forbidden on the island, but hiking is highly recommended as there are 70.5 miles of roads and trails. There are no cars in the park, or anywhere on the island, so hiking, biking, horseback riding or horse-drawn carriages are the only way to get around. Founded in 1870, Fort Mackinac once protected Mackinac Island from unfriendly visitors and served as a home for soldiers and their families. It is now a tourist attraction filled with informative exhibits and unique weaponry. There are 14 historical buildings at the site, one of which is the oldest building in Michigan. Guests can listen to stories from interpreters that detail Mackinac Island's past and the lives of people who lived at the fort. There is also a portion of the museum with interactive exhibits for children. 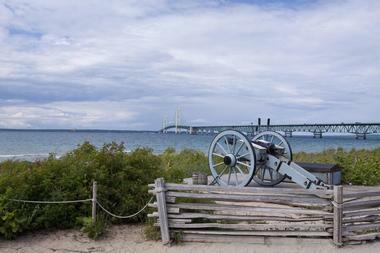 Fort Mackinac is open seven days a week from May to October. Located near the coastline on the east side of the island, Arch Rock is a natural rock formation with a fifty foot span at the widest point. Water and wind took thousands of years to work on the soft limestone rock, slowly dissolving it to leave only harder breccia rock in the form of an arch. The Arch stands 146 feet above the water level and can be reached by taking the Arch Rock Bicycle Trail, Arch Rock Road or Lake Shore Road. Native Americans believe that the arch has many super powers and have many legends about it, but tourists should not be daunted by these myths and are encouraged to come see one of the most important attractions of Mackinac Island. 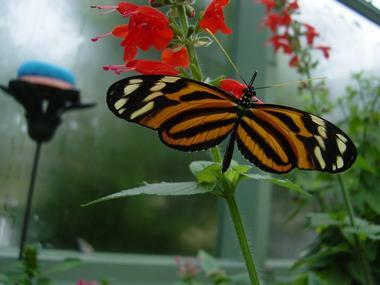 The Original Mackinac Island Butterfly House is one of the oldest museums of its kind in the United States and the first in Michigan. The lush tropical garden is full of hundreds of colorful butterflies from all over the world and occupies 1800 square feet of the grounds. The Education Room provides information about the butterfly industry and has about 500 chrysalis cases where visitors can observe the emergence of butterflies from the chrysalis stage. 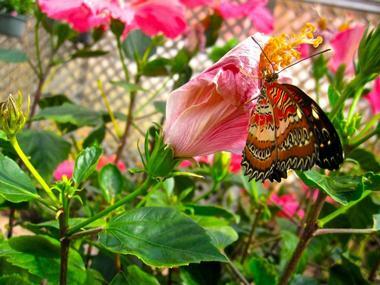 Butterfly Garden is a spacious, airy room full of tropical blooms where butterflies of all sizes and colors fly freely, dancing to the sound of falling water and music. Insect World features hundreds of species of bugs from all corners of the world, including 16" walking sticks, the heaviest bugs in the world. 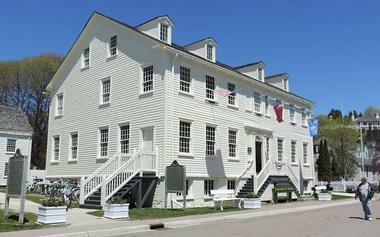 Downtown Mackinac is home to a range of historic attractions. Guests can stop by the McGulpin House to learn about William McGulpin, a Mackinac Island resident who worked for the American Fur Company. At the American Fur Company Store and the Dr. Beaumont Museum, visitors can discover the story of Alex St. Martin, a Canadian explorer whose injured stomach was used as a testing ground for medical experiments. 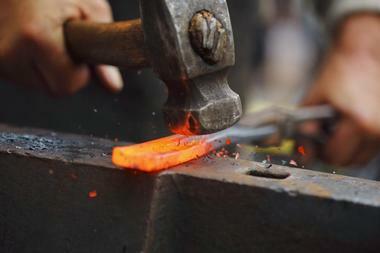 The nearby Biddle House is a good spot for learning about domestic life on Mackinac Island, and the adjoining Benjamin Blacksmith Shop is used to teach visitors about blacksmithing techniques. 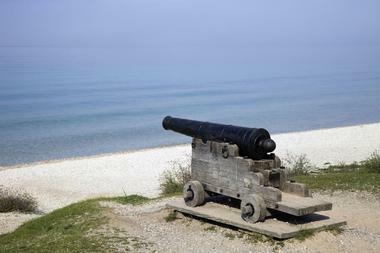 Fort Holmes, originally named Fort George after King George III of Britain, is a small fort 890 feet above sea level. 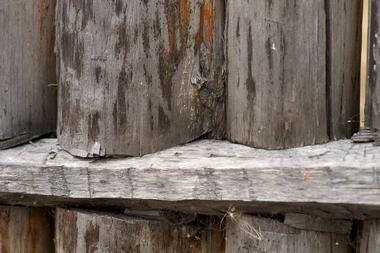 The fort is made of earth and wood, squatting on the top of the highest hill on Mackinac Island. The fort that is here today is a replica, the original fort was built by the British in 1814 to protect Fort Mackinac from the attack by the United States Army. The fort ended up not being involved in the attack and American soldiers reoccupied the island peacefully for a few years. After the end of the War of 1812, Americans renamed the fort to Fort Holmes in honor of American Major Andrew Hunter Holmes who was killed in battle. At the time when the Mackinac National Park was established in 1875 and Mackinac Island State Park in 1895, what was left of the fort were two viewing towers offering magnificent views of the Straits of Mackinac. The fort was reconstructed in the 1930s and then again in 2015 and today its walls and blockhouse are made of earth and logs. The site attracts many visitors and can even be rented out for special occasions. 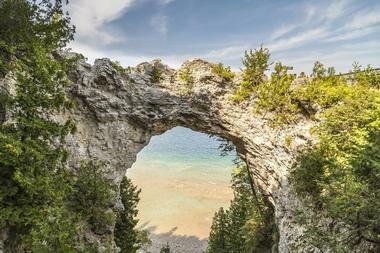 There is more to Mackinac Island than just spectacular natural beauty. The Richard and Jane Manoogian Mackinac Art Museum offers visitors a glimpse of the art inspired by Mackinac through the centuries. The museum's diverse collection covers a range of art styles and expressions such as hand-beaded clothes made by Native American garments, 17th and 18th century Great Lakes maps, rare and unique decorative pieces from the heyday of the Victorian period and original photos of the island from the 19th and 20th century. Among the most significant are the works of William H. Gardiner, such as his hand-tinted early-20th century photos. There are four collections that cover Native American Art, historic maps, photos and early 19th century views of the island. The Museum also organizes popular temporary exhibits, contemporary art shows and a kids' art studio. Wings of Mackinac Butterfly Conservatory is a beautiful tropical greenhouse in Surrey Hills on Mackinac Island that provides a home to hundreds of butterflies that roam free between colorful tropical blooms. Stone fountains provide soothing humidity and a pleasant sound of falling water, making the environment as delightful for the butterflies as it is to visitors. The Conservatory opened its doors in 1997 and moved to its current location in 2002. 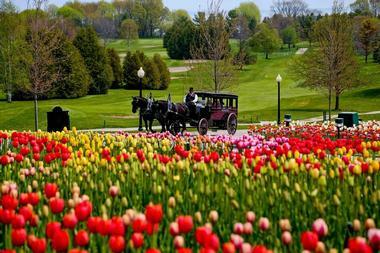 Their partnership with Carriage Tours makes a stop at the Conservatory a wonderful option for the tourist of Mackinac Island. Over the years, butterflies in the conservatory have been joined by finches, a box turtle called Gennie, a Scarlet McCaw aptly called “Mackie J” or The Mackinac Jewel, Cammie the chameleon, goats Pierre and Surrey and tree frogs. 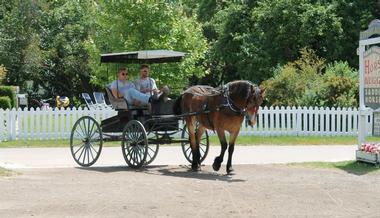 Traveling on Mackinac Island by horse-drawn carriage is a favorite past time among tourists and locals alike. The Grand Hotel stable offers narrated carriage tours that stop by some of the most well-known historic sites on the island. Adventurous visitors can opt for a horseback riding tour. With more than 40 miles of marked bridle paths, Mackinac Island is the perfect spot for equestrian enthusiasts to explore. Lastly, the Grand Hotel stable offers private carriage tours with a guide for guests who want to create their own itinerary. 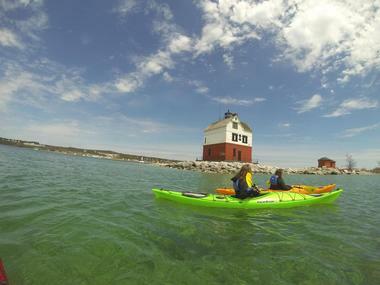 There is no better way of exploring beautiful Mackinac Island than slowly gliding in a single or double kayak or paddleboard along the rugged coast, watching the beautiful historic lighthouses, spotting the birds or turtles or just enjoying a quiet time on the water. Great Turtle Kayak Tours offers several different tours such as the Sunrise & Sunset Cruise, Arch Rock Excursion, Devil's Kitchen Adventure as well as many other incredible tours around the Haldimand Bay and Mackinac Island. Each tour is accompanied by a trained and experienced Red Cross-certified guide, so guests can feel safe with the knowledgeable guides. There are tours for all ages and skill levels, so those who are new to kayaking and paddleboarding will feel at ease. A trip on the quiet waters of Lake Huron with the experienced guides and magnificent scenery is sure to be an unforgettable adventure. 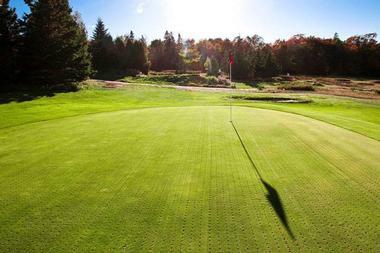 The Wawashkamo Golf Club sits high on the hills of Mackinac Island. As one of Michigan's oldest golf courses, the Wawashkamo course has unique features, such as natural hazards, that distinguish it from modern golf courses. The golf course is open to the public and there is a PGA-certified instructor on hand to coach golfers of all ages. The course and adjoining clubhouse can also be rented for private functions. 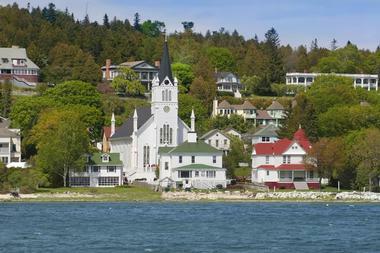 Sainte Anne's Church is a very beautiful Roman Catholic Church that dominates the view of Mackinac Island from the sea. The current church was built in 1874 on the land donated by Magdelaine Laframboise, a prominent island figure and a former fur trader. 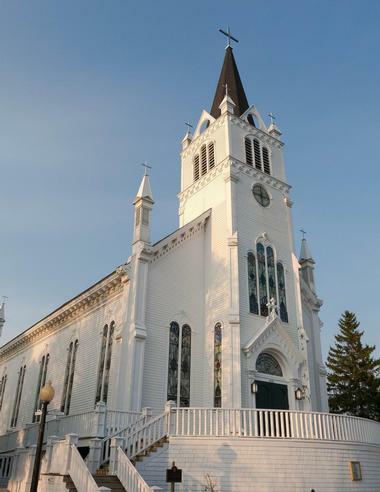 Catholicism was brought to Mackinac Island in 1670 by Jesuit missionaries, who built the first church made of wood in 1781. Ste. Anne's is the oldest Catholic Church in Michigan and is designated as a Michigan historic site. It is also the first church dedicated to Sainte Anne, causing quite a controversy since Dominicans did not believe that Anne was holy. The first church building was a small structure made of wooden logs and it was brought to the island from the mainland, across the frozen lake. Current stained glass windows were installed in the 1920s replacing the original glass ones, and more stained glass windows were added in 1930. There is a charming museum in the church basement, depicting the history of the church and Mackinac. Home to one of the most popular treats on Mackinac Island, Murdick's Fudge has been a staple of Northern Michigan for nearly 130 years. The family-owned business has used the same proven methods for making fudge since 1887. 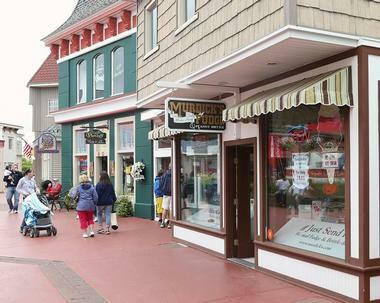 Today, there are several Murdick's Fudge stores on Mackinac Island as well as stores in other parts of Michigan and Massachusetts. You can also purchase any of Murdick's fudges online. The company has 18 unique fudge flavors to choose from as well as special gift packages for weddings, birthdays and holidays. Started in 1974, The Haunted Theatre showcases monsters from Mackinac Island's past. The theatre teaches visitors everything worth knowing about mythical creatures and legendary beings. It also happens to be on an ancient Indian burial ground, which serves as the basis for its theme. It is a family-friendly attraction that is suitable for people of all ages. Admission is $7.00 and the theatre is open year-round. Guests can also book the theatre for special events such as birthday parties, corporate functions and other special gatherings. 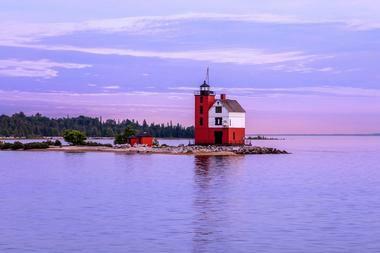 Round Island Lighthouse sits on a small outcropping that juts into the Straits of Mackinac. Round Island Lighthouse was erected in 1895 and suffered a period of decline in the late 1920s. It was decommissioned and nearly demolished, but then the local Forest Service stepped in to help. Locals also banned together from the 1970s to the 1990s to preserve the lighthouse's unique appearance and special history. Currently managed by the five-member Round Island Lighthouse Preservation Society, attending the annual summer open house is how most locals and visitors get a glimpse into the lighthouse's past. The Stuart House City Museum is housed in a historic building that is known for being central to the fur trade in the 1820s. Founded in 1841, the museum is one of several old buildings that have been converted into a city hall, a fire station and a courthouse. 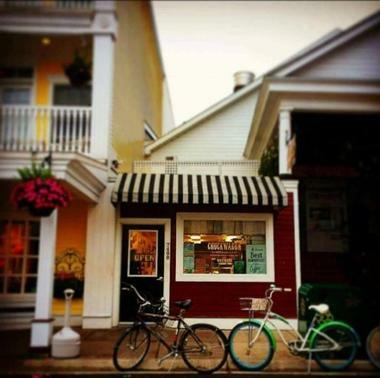 The museum contains old photos of Mackinac Island, information about the island's famous black bear, Cubbie, as well as an overview of the local fur trade. The museum is open during the summer months and admission is paid in the form of a donation. Jewel Golf Course, also known as Golf-on-the-Jewel, is hailed as one of the most unique golf courses in the United States. The course is located across the street from the Grand Hotel. With views of Lake Huron and Round Island in the distance, it's no wonder that the magazine Golf Digest gave Golf-on-the-Jewel an editor's choice award in 2016. 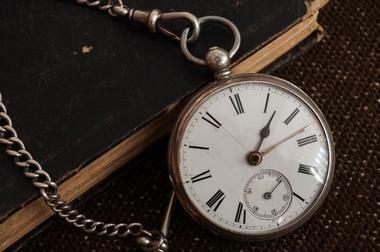 The course is suitable for experts and novices alike and it is open for public use. A PGA-certified instructor is available to help golfers who want to improve their game. Mackinac Island Carriage Tours gives guests a unique insight into Mackinac Island's interesting history. Tours offered by the company include stops at four popular places: The Surrey Hills Museum, the Wings of Mackinac Butterfly Conservatory, Arch Rock, and the Fort Mackinac Avenue of Flags. You can also add a stop at the Grand Hotel to your itinerary. The narrated tour lasts for 45 minutes to an hour and has no set departure times. To purchase tickets, visit the company's website or go to the local ticket office. 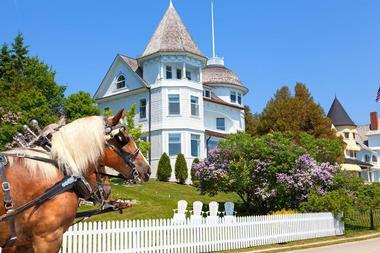 Jack's Livery Stable is a one-stop shop for equestrian adventures on Mackinac Island. More than 80 percent of Mackinac Island is accessible by horseback or carriage, and horseback or carriage rides can be reserved in advance or on the same day in-person at Jack's Livery Stable. Rentals last for an hour, and for carriage rides, costs vary depending on the size of the carriage that you would like to rent. Jack's Livery Stable has two-person, four-person, and six-person carriages. More information about the company's horse and carriage rentals is available online. The Mackinac Island Observation Tower at Mission Point is a prime spot for stunning views of the island and the surrounding waters. As visitors make their way to the top of the tower, they can view five floors of historical exhibits. For the most part these exhibits focus on the nature and history of Mackinac Island and the Great Lakes region, but there is also a display devoted to the film Somewhere in Time, which was shot at the Mission Point property. The tower is open daily and admission is $5 for adults and $2.50 for children. Housed on a historic farm, the Mackinac Community Equestrian Center is home to the Mackinac Horsemen's Association (MHA). The Equestrian Center routinely hosts events for local horse enthusiasts. In addition to events, the Equestrian Center offers horseback riding lessons, arranges for horse-related volunteer opportunities, and rents out space for people to board their horses. Locals can also lease horses through MHA and get involved in horse camps and clinics. Visitors are welcome to stop by the Equestrian Center at any time to see the Historic Photography Exhibit or to take a tour of the facilities. EUP Fishing & Charters takes guests on guided fishing trips around Mackinac Island. Visitors glide through the Straits of Mackinac on the Osprey IV, a clean, modern sport fishing boat captained by Dennis Gorsuch. Guests who come on the guided fishing trips can expect to catch different types of fish throughout the year, but in general the waters around Mackinac Island are filled with King & Atlantic Salmon, Lake Trout, and Steelhead Trout. The fishing trips are available year-round upon request and typically last for 3-5 hours.